Last October Bonhams withdrew a piece of Lydian silver from auction after questions were raised here about its possible links with Turkey. Late Period, 26th Dynasty, circa 665-525 B.C. Egyptian Culture Minister Faruq Hosni said in a statement that he had asked for the 2,500-year-old carved limestone relief to be withdrawn from Bonhams' London sale, set to take place on Thursday, because it was stolen. Hosni said the ministry had no idea the piece, from Egypt's ancient city of Luxor, was missing until they saw it in the catalogue. Apparently the buyer bought it in good faith. We work hand in hand with the police and they are satisfied that the buyer bought it in good faith. Negotiations will begin and it will either stay with the current owner or be repatriated but we are not selling it. How could the "buyer" (I presume the vendor) have bought it in good faith if the catalogue entry says that the present owner had inherited it from his father? Is the vendor in reality "an Australian private collector who began collecting in the 1940s whilst working in the merchant navy"? 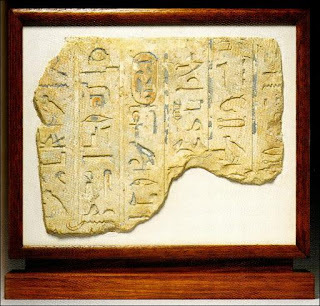 Will the relief fragment be returned to Egypt or the vendor? This story seems to have been unreported in the British media. However it does raise questions about the due diligence process conducted by Bonhams. Has the time come for auction houses to improve their levels of transparency? Who is this anonymous seafaring Australian private collector? Should the present proprietor of the object be named? Bonhams' action does not mean that the piece has been taken out of Egypt after 1983, however, just that the Egyptian government has asked for the matter to be investigated. It would be interesting to know which site the relief is believed to come from, and the date at which it was recorded in situ (if it ever was, or whether the piece can be ascribed to a location by the text type, as seems equally likely). The sale of relief fragments is a bit of a grey area: a relief fragment published in situ in the 1950s was returned to Egypt by a private collector a few years ago even though (I think) it was sold in the 1960s. Amarna period talatat, from monuments dismantled in antiquity and excavated after World War II, are still sold today (a couple were in the Bonhams sale).